Have you ever been in your dashboard and needed to get information from another website? Were you aware that you can add external links into you dashboard? 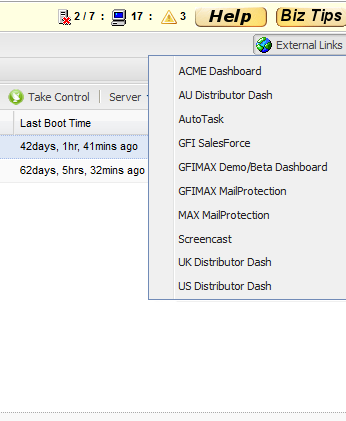 You can add links to other websites and even save your log in credentials to the other sites in your GFI MAX Dashboard. The External Links button gives you quick access to all of the websites you have created links to. To add a link to another external application or web-site, select New and then complete all of the following information. Name - the name of the link as it will appear in the Dashboard. URL - the full address of the web-site or application that is the target of the link. Method - the way in which parameters are passed to the external application or web-site. POST will send parameters and their values in the request and as such they are hidden from the user. GET will add the parameters and their values to the query string and as such they are visible in the address bar of the browser. Parameters – is used to pass information such as usernames, passwords and actions to the external web-site or application. Simply enter the Name and Value of the parameter for it to be passed to the external application or web-site using the method selected. Please note that if the parameter name contains pass, passwd or password, the value entered will not be visible once the link has been saved. Once the required information has been entered, click Save. GFI MAX Mail Protection and Monitis are already in your dashboard so you can use these links immediately. This can be used as a first step into Remote Management and Mail Protection integration. More integration is coming soon. Also, make sure you use this feature to add a little website called www.allthingsmax.com. I hear that the articles posted here are quite informative.